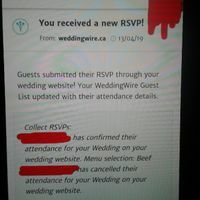 Tech support | Weddingwire.ca Community ARE YOU A VENDOR? If you have any doubts regarding how the community works or about the WeddingWire tools to organise your big day, you can solve them here. If you see that something's wrong, please let us know in this group, you'll help us improve. Why Can’t I Find Anything for Vegas?! I have a feeling my settings are screwy or something but we are getting married in vegas and I cannot search for ANYTHING there! Nothing comes up. Do I need to use a different app?